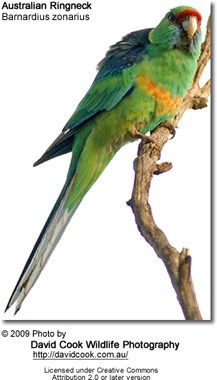 The Mallee Ringnecks (Barnardius zonarius barnardi or Barnardius barnardi) - also known as the Mallee Parrots -- are native to south-eastern Australia (Queensland to South Australia). They are common in mallee scrub, open woodlands, where they blend extremely well with their surroundings. They are often seen in pairs or family groups feeding in branches or shrubs. 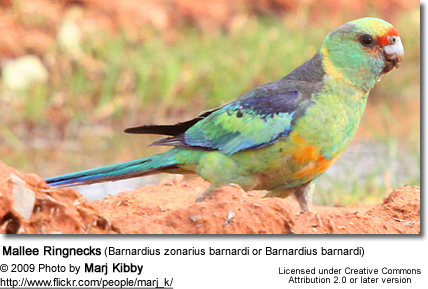 This parrot belongs to the genus barnardius, along with the Port Lincoln Parrot, Cloncurry Parrot, and the Twenty eight Parrot. 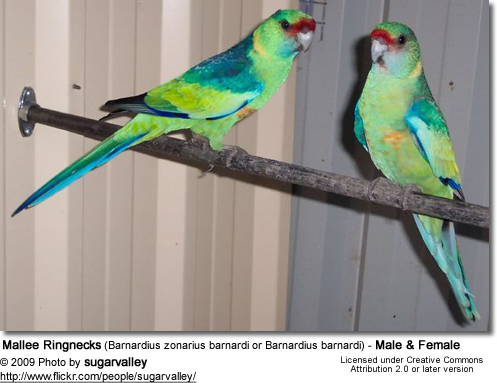 These parrots all have a green body and a yellow ring or collar around their necks and are referred to as Australian Ringnecks. This parrot averages 12.2 - 13.75 ins. (33 - 35 cm) in length. Overall plumage is green; crown and sides to head bright green, cheeks with slight bluish tinge; red band to forehead; nape olive-brown with adjoining yellow collar on back of neck; lower back blue-black; breast and abdomen turquoise with a variable orange-yellow band; bend of wing blue becoming blue-green on lesser wing-coverts; greater wing-coverts yellowish-green; secondaries (shorter, upper "arm" feathers) dull green; primaries (longest wing feathers) and primary wing feathers dark blue; under wing-coverts blue; middle tail-feathers dark green with blue tips, outer feathers blue with pale tips; bill grey-whitish; narrow periophthalmic ring grey; iris dark brown; feet grey. Females have a paler plumage; back and lower back dark grey-green; under wing-coverts greyish; pale under-wing stripe usually visible. Immatures with duller plumage than female; nape and back of crown brownish; blue to cheeks usually more extensive; back and lower back grey-green; under-wing stripe usually present. These parrots spend considerable time preparing the choosing and preparing the nesting site. They line the bottom of the tree hollow with decaying wood dust and make a shallow depression for the eggs. The courting male chatters constantly while crouching in front of the female, with his tail fanned and moving quickly from side to side. During this mating display, he squares his shoulders and wings and vibrates them slightly. 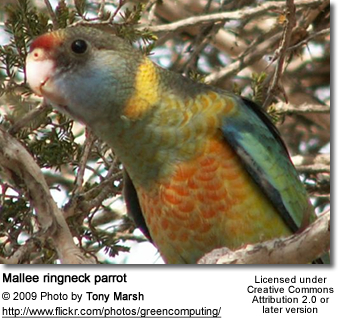 Mallee Ringneck Parrots are known for their aggressiveness towards other flight occupants. For this reason, it is best to only keep one pair per flight. The aviary should be at a minimum 10 feet (3 meters) long and 3 to 3.5 feet (about one meter) wide. It is strongly recommended to install double wiring between each flight, or else injuries to feet are common. Leafy branches from trees that are known to be safe for birds (non-toxic, untreated) should be placed in different areas to give them options for perching as well as chewing. This will entertain the birds and provide the birds the benefit of being able to exercise their beaks. Natural branches of various diameters, placed at various locations and angles, make excellent perches. These parrots should be provided a quality parrot seed mix along with a variety of fruits, green leafy vegetables and vegetables. Seeding grasses and green can be offered. Dimensions are average and can vary widely, influenced by the bird's and the owner's preferences. Parent bird's preferences can be influenced by the size and type of nest-box / log in which they have been raised. Offering a choice of sizes and types of logs or nest-boxes, and placed in various locations within the aviary, will allow the parent birds to make their own choice. Once a pair has chosen a specific nest-box/log and been successful in it, offer that one to them each breeding season. Once a pair has chosen its log or nest-box, the other ones can generally be removed. The hen lays usually four to six white eggs, which she incubates for 20-21 days. The young fledge when they are about 30 days old. The young should be removed from the parent birds after they have become fully independent to avoid possible aggression from a parent bird and to allow the adult pair to possibly start another clutch. Their natural diet includes seeds of grasses, herbs, fruit, blossoms, leaf buds and insects and larvae.